Picture Perfect Birthday Treat Bags! Celebrate The Good Stuff! How cute are these treat bags made with the Picture Perfect Party DSP! I absolutely love the colours in these papers! Bermuda Bay, Berry Burst, Peekaboo Peach and Lemon Lime Twist. The paper stack has 48 double sided sheets. Side A has photographic images and side B has the most gorgeous coordinating patterns. They are just perfect for holding gift cards (envelopes are so boring aren't they), gifts, chocolate or for party bags. Here is the You Tube video showing how I made them. I hope you like the video. please give me a thumbs up if you do and subscribe. I held my monthly team meeting last night for those that are local. I have a growing team and it's a great opportunity to connect, share inspiration and ideas. I like to reward my team too for reaching their goals and for anniversaries. I love my team, we have a lot of fun. We had an anniversary to celebrate last night so I made one of these treat bags to hold some goodies inside for her. We then went on to make the treat bags as the evening's make n take. They are all so different depending on the papers chosen. I couldn't resist using the Birthday Mini Binder Clips that come in the matching colours in this suite. I really hope you like my Treat Bags. . Do subscribe to my blog for lots more inspiration dropping into your inbox. Just click the subscribe button at the top. 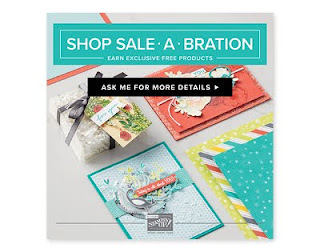 See SALE A BRATION here! Saleabration runs from January 3rd until March 31st and offers lots of ways to benefit. You can earn free products from the Saleabration promotion for every £45 spend in my online shop. (You can only earn these products, you cannot buy them) Also Stampin' Up! have brought another reward level to Saleabration this year! If your spend comes to £90 you can earn a gorgeous set of dies. Fill your basket with all your paper crafting needs and get more free! 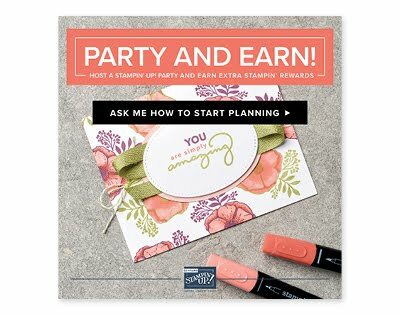 If you host a Stampin gathering, or a private class and your order total comes to £200 you will receive an extra £20 on top of your Rewards you have already earned, plus your free Saleabration items! - perfect timing for your gathering - contact me to book a date in! JOIN! 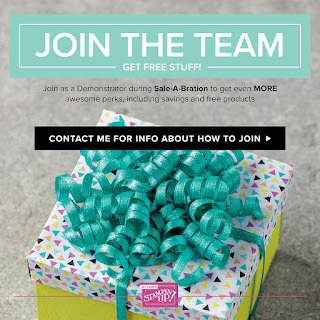 Join my team during Saleabration and receive the best deal in the catalogue! Choose £130 of any products in either the Spring/Summer or the Annual catalogue and get an extra two free stamp sets all for just £99. You will also receive free postage and packing, and some office supplies to get you started! It is the perfect flexible working from home opportunity, fit it around your children or your job. You receive at least a 20% discount, have opportunity to be part of a huge friendly crafting community, attend fun events and travel too if you like. Contact me for a no obligation chat or click JOIN HERE - where you can see all the T's and C's too. I would love to have you as part of my team! I will be posting lots of new projects using products from the new catalogue so keep popping back for lots of paper craft inspiration. Thank you for reading. 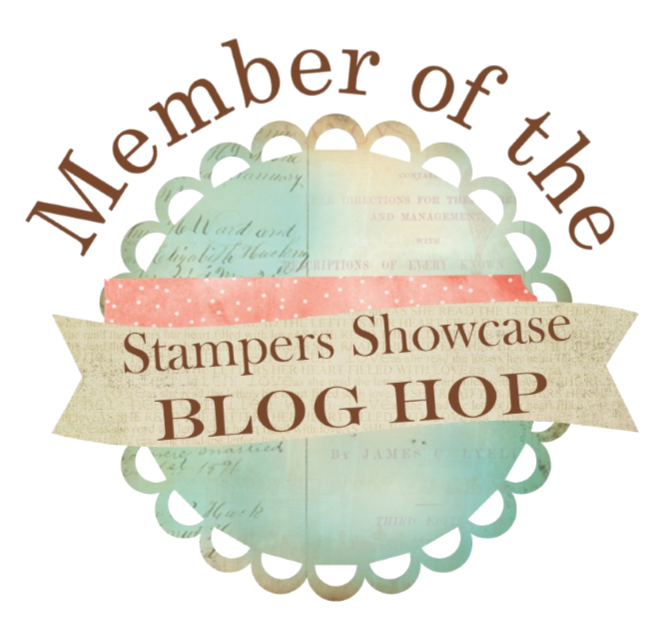 If you would like to shop Stampin' Up! you can SHOP HERE. If you have placed an order or attended one of my events in the last year you will have received a copy of the brand new catalogue. If you would like a complimentary copy, request one Here. I would love to earn your custom. Sale-a-bration Sunday I You Are Simply Amazing ! Woohoo! 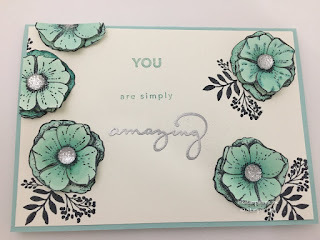 It's time for Sale-a-bration Sunday and this week I am using the Amazing You stamp set. Saleabration items are FREE with a £45 order in my online shop here . It runs for 12 weeks until March 31st which takes it right up to British Summer Time on March 25th marked by the clocks going forward bringing in the lighter evenings. I am SO looking forward to that but in the mean time we can craft the winter away. Win/Win! The Amazing You stamp set has got to be one of my favourites! I love the flower so much! 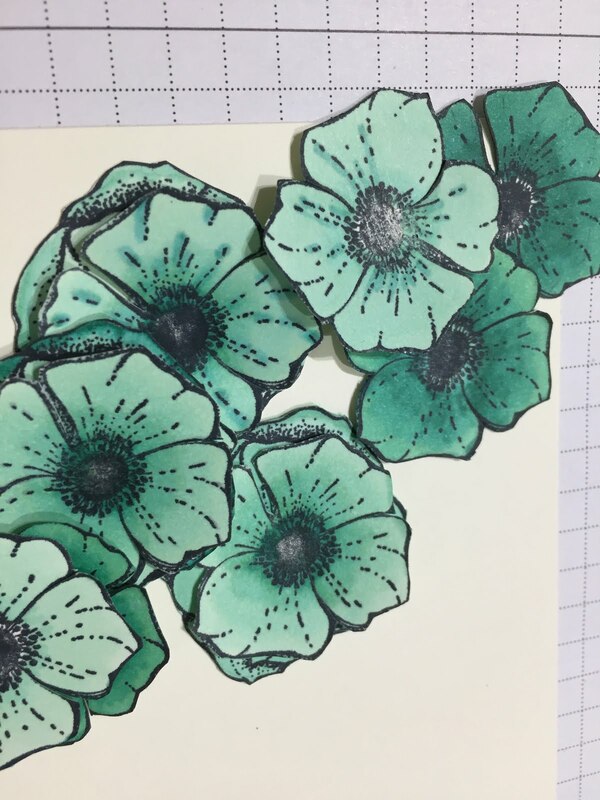 It is perfect for colouring in with the Stampin Blends alcohol markers. I have cut the flowers out and the middle flowers to to give dimension to the card, added a Faceted Gem to the centre of each and a little heat embossing in Silver to make it a little more special. Here is my You Tube tutorial for this card. I really hope you like the video, please give me a thumbs up and subscribe if you do. There was a little cutting out but it was easy, I promise. 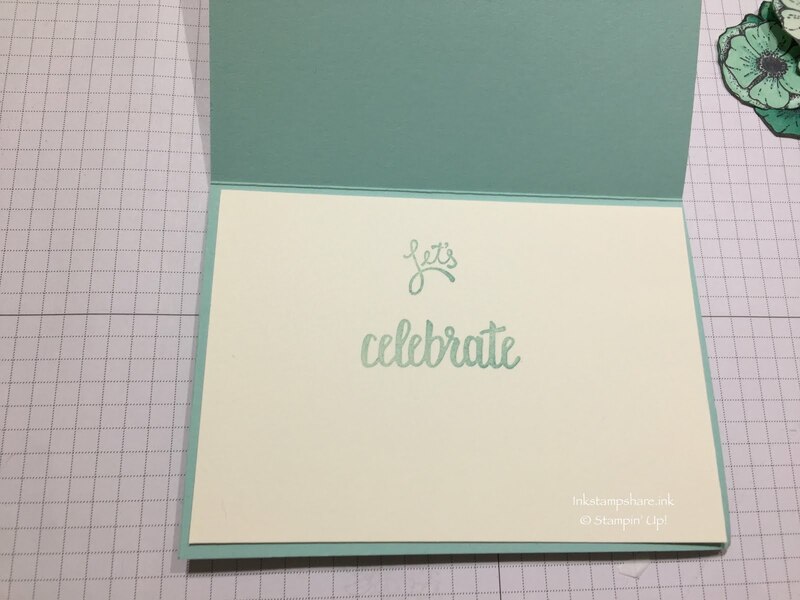 The sentiments in this set are perfect for any type of congratulations/celebration card. I have used Pool Party card stock for my base. A4 cut in half at 14.8 cm and scored at 10.5 cm. The Very Vanilla panel is 14. 3 cm x 10 cm. I can see that I will be using this set a lot and it is beautiful with or without colour, though that Dog Rose lends itself to colouring with all sorts of medium. I have a lot of ideas for it whirling around in my head. All the products I have used on my card are shown below with clickable links. Come shopping with me online and receive a hand made card and a little gift to say thank you. I really hope you like my Amazing You card. Do subscribe to my blog for lots more inspiration dropping into your inbox. Just click the subscribe button at the top of the page. There has been a lot of productivity in my craft room lately. I love to craft when Winter is in full swing don't you? 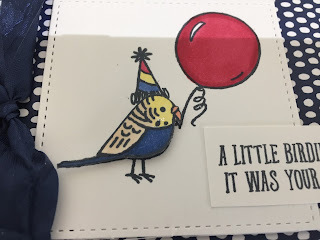 I'm getting prepared for some birthdays coming up with the Bird Banter stamp set from Stampin' Up! How cute is this little guy ? I have used the Blends alcohol markers to colour him in, in Night of Navy dark and light shades, Cherry Cobbler, Daffodil Delight and Ivory. The blends are available individually, in a light and dark shade combo or the whole set. See my You Tube Tutorial here. I hope you like the video, please give me a thumbs up and subscribe if you do! I added one of the little silver metallic shapes to accent. 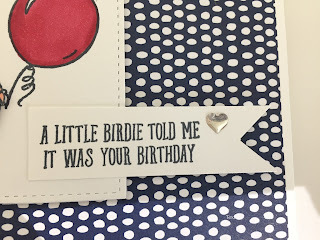 My card base is Whisper White card A4 cut at 14.8 cm and scored at 10.5 cm. The panel is Designer Series Paper. Tutti Frutti Paper Stack. Cut at 14.3 cm x 10 cm. Happy Birthday inside. Such a cute font. So many fun little birds in this stamp set with some great, fun sentiments to go along side. All the products I have used on my card are shown below with clickable links. Come shopping with me and receive a hand made card and a little gift to say thank you. 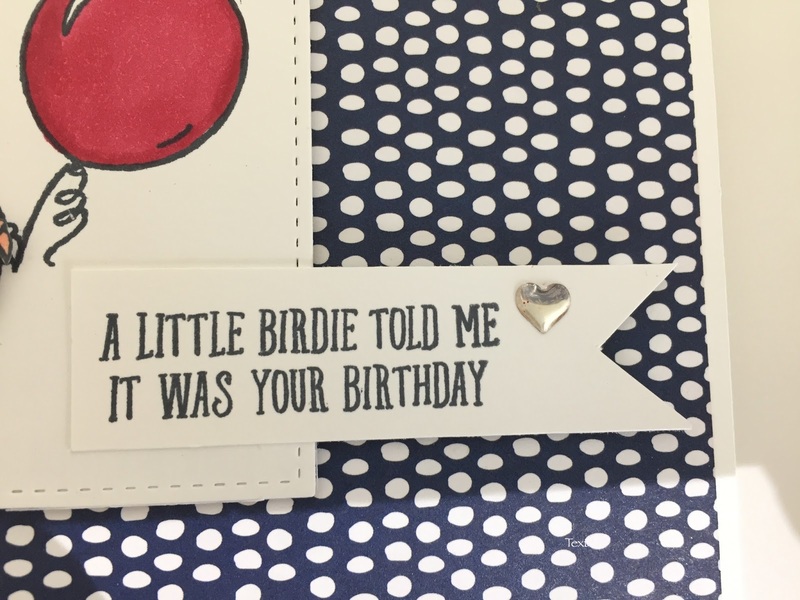 I really hope you like my Bird Banter birthday card. Do subscribe to my blog for lots more inspiration dropping into your inbox. Just click the subscribe button at the top of the page. 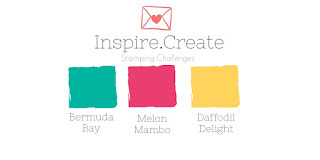 Cute Picture Perfect Party Boxes for the Inspire Create Stamping Challenge 010! 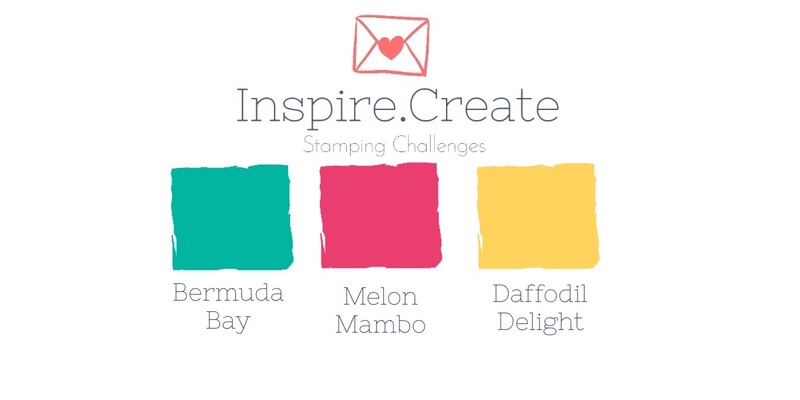 This week for the Inspire Create Stamping Challenge #010 we have a Colour Challenge. I took it as inspiration and decided to make some cute little gift boxes, just changing the colours to fit the challenge . They are so simple to make using the Envelope Punch Board. They are so cute and quick to make too. I LOVE these mini binder clips. 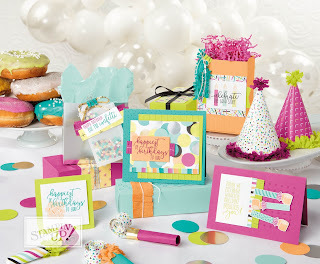 They are part of the Picture Perfect Party Suite and come in Berry Burst, Lemon Lime Twist, Silver and Bermuda bay. To keep with the colour challenge I have used Bermuda Bay and Silver. If you enjoyed the video, please let me know, give me a thumbs up and subscribe. Line edge up at 1.5", punch and score, line up at 4", punch and score. Continue to then line up your score line at the indicator on all 3 remaining sides. Here are the products I have used with clickable links to my online shop. 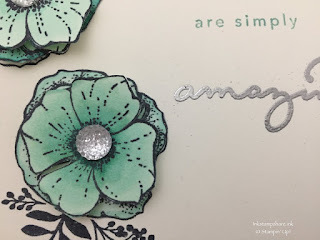 See what the rest of the talented Design Team on the Inspire Create Stamping Challenge have come up with this time here. Its great to see all the different projects that are made and also all the entries into the challenge too.It is open to everyone and is lots of fun to take part. 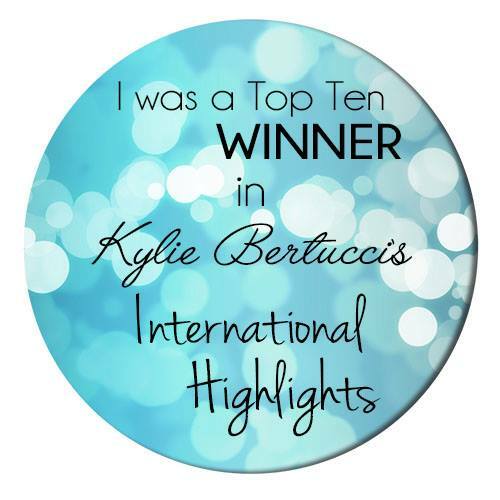 Each challenge a winner is chosen from the entries who can then display the badge on their blog, so do join in! I really hope you like my box. Do subscribe to my blog for lots more inspiration dropping into your inbox. Just click the subscribe button at the top of the page. Saleabration Sunday! Pretty 4x4 Notecard Box with Lots of Lavender! Lots of Lavender from Stampin' Up! Saleabration runs for 12 weeks until March 31st which takes it right up to British Summer Time on March 25th marked by the clocks going forward bringing in the lighter evenings and I can't wait! This week we have this pretty box for 4 x 4 note cards stamped with " Lots Of Lavender "
I have a hedge of lavender in the garden and in the summer it looks and smells amazing! It attracts the bees too. It is still looking very sad in this cold wet January but these stamped images remind me that spring is not so far away. I have made two and stamped them slightly differently. I think I prefer the outline stamped in black. What do you think? Here is the You Tube Tutorial for the box and cards. I hope you like it, please give me a thumbs up and subscribe if you do. measures 10.5 inches x 5.5 inches. You need just one piece of A4 card. I have scored with the long side at the top at : 0.5, 5, 5.5, and 10 inches. With the short side at the top at 0.5 and 5 inches. The note cards are 4 x 4 in Very Vanilla. Each card requires a piece of card stock 8" x 4" and scored at 4". I have the perfect friend in mind to gift these to. She loves to write. She has pen friends globally. It is so heart warming to receive a card in the post, especially one that is hand made. You can get these stamps for free during Saleabration. Place an order/see all the free saleabration items in my online shop Here and for every £45 spend you can choose a Saleabration item for free. Or if you spend £90 you can choose a higher reward item this year. Is your wish list long? Join my team during Saleabration and receive the best deal in the catalogue! Choose £130 of any products in either the Spring/Summer or the Annual catalogue and get an extra two free stamp sets all for just £99. You will also receive free postage and packing, and some office supplies to get you started! IIt is the perfect flexible working from home opportunity, fit it around your children or your job. You receive at least a 20% discount, have opportunity to be part of a huge friendly crafting community, attend fun events and travel too if you like. Contact me for a no obligation chat or click JOIN HERE - where you can see all the T's and C's too. I would love to have you as part of my team! Thank you so much for reading my post. I hope you are enjoying my Sale-a-bration Sunday Series. Click subscribe if you would like to follow my blog. 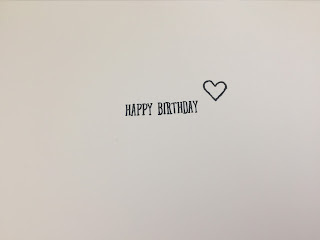 How pretty is this birthday card?! 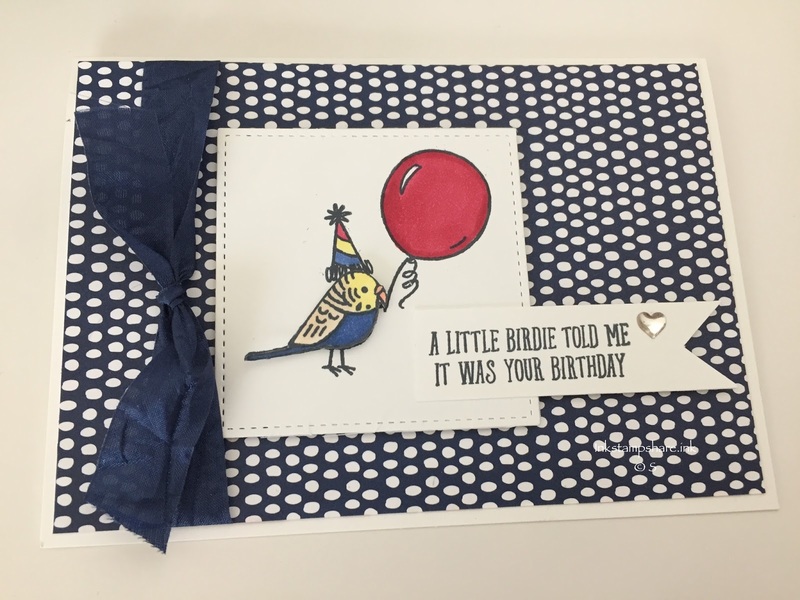 It is made using the Picture Perfect Birthday stamp set. It is from the 2018 Spring/Summer Catalogue and is part of the Picture Perfect Party Suite. For this card I have used just the stamp set but I love the colours in the Suite and was inspired to use them in the card. I used Bermuda Bay and Lemon Lime Twist. I have replaced the Berry Burst with Flirty Flamingo to change it up a little. I really hope you like the video, Give me a thumbs up and subscribe if you'd like to see more. The Whisper White Layer is cut at 14.3 cm x 10 cm. The bows are stamped onto the card and I also fussy cut a few out and attached with dimensionals to give some depth. I have added in a few of the Adhesive Backed Sequins in Pool Party and Lemon Lime Twist. I love this sentiment! Perfect for any celebration. One with Happiest Of Birthdays To You. There are 18 stamps in this set and it's price is just £15! I have only used a couple of the images on this card and I already have plans for lots of the other images. The party noise blower is so cute! So watch out for more projects with this stamp set on my blog. Epic Celebrations Guitar Card ! I love the guitars in the Epic Celebrations stamp set free with Saleabration. I created an ink splattered back ground for this card. The Brusho Pigment Inks are perfect for this. Brushos in Prussian Blue and Red were used to create the back ground on Whisper White Card. Card layer is 14.3 x 10 cm. Card base is in Night of Navy at 14.8 cm x 10 .5 cm. Inside panel in Whisper White is 14. 3 cm x 10 cm. You can view my You Tube tutorial here. If you like my video, please give me a thumbs up and subscribe. Splattered ink on the Stitched Square die cut. I have made the guitars shiny by using the Fine Tipped glue Applicator and raised them on dimensionals. "You're Awesome" inside in Night of Navy with Real Red stamped over the top. Its a fun, useful set. Perfect for music lovers and teenagers too and I know exactly who these two cards will be going to. This stamp set is FREE with Saleabration. If you would like to browse all the Free products from Saleabration, you can see them HERE or click on the Saleabration Brochure image in the side bar. JOIN! Join my team during Saleabration and receive the best deal in the catalogue! 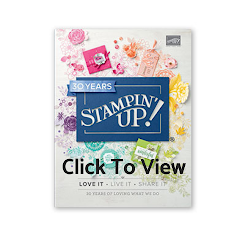 Choose £130 of any products in either the Spring/Summer or the Annual catalogue and get an extra two free stamp sets worth up to £90 all for just £99. You will also receive free postage and packing, and some office supplies to get you started! That is £224 of your choice of paper crafting products for £99! It is the perfect flexible working from home opportunity, fit it around your children or your job. Run it as a business or a hobby, you receive at least a 20% discount, have opportunity to be part of a huge friendly crafting community, attend fun events and travel too if you like. Contact me for a no obligation chat or click JOIN HERE - where you can see all the T's and C's too. I would love to have you as part of my team! If you would like to subscribe to my blog, click the subscribe button in the sidebar and each time I post it will drop into your inbox.